Nowadays, people are vastly using smartphones and tablets which have made their life pretty easy. They are using them in various ways they haven’t imagined before. With an abundant amount of apps in phones, monitoring health, bank accounts, social networking accounts and much more is an easy task. Smartphones have really made humans smarter! But, one area where the smartphones still fall short is the battery life, this is why Power Banks were imagined. But when you go out in the market to find a good power bank, the market is overcrowded with tons of power banks from lots of local and international manufacturers. So, to help you out in picking the best power bank, we have compiled the list of 5 Best Power Banks under 1500 Rs. available in India. It comes with two USB ports, with which you can simultaneously charge two devices, with the same amount of charging capacity allotted to both the ports. Being a 2nd generation power bank, the Mi 2i 20000 mAh Power Bank is compatible with most of the devices which are currently available in the market. The outer protection of the Mi 2i 20000 mAh Power Bank is made out of a combination of PC + ABS material. These provide a perforated exterior to the device, which not only provides resistance from scratches but at the same time provides a comfortable and slip-resistant hold. The Mi 2i 20000 mAh Power Bank takes 6.7 hours to charge via 9V/2A, OEM charger and if you have a 5V/2A, OEM charger, it might take up to 10 hours for the power bank to reach its full capacity. improves charging conversion rates but also stabilizes the discharging rate. The Mi 2i 10000 mAh Power bank offers a conversion rate of more than 90%. The Mi 2i 10000 mAh Power bank is compatible with devices which require 5V/2A, 9V/2A and 12V/1.5A charging. If that’s not all, it also comes with a low power charging mode, which allows you to recharge your smaller devices such as smart bands, smart watches and Bluetooth headsets. Based on the reviews which the device has garnered from the consumers, the device provides around 95% conversion rate. It is very durable and weighs about 300 gms, so you do not have to be worried about carrying around a bulky looking device, for the sake of charging your phone. The Lenovo 10400 mAh Power Bank and Lenovo 13000mAH Power Bank are few other power banks from the house of Lenovo, which are little old but are still good. With advanced IC protection, Syska has been touted as being one of the most stylish looking power banks out there in the market. The Syska 10000 mAh Power Bank on a full charge, allows two smartphones to be recharged simultaneously. As it’s evident, the power bank comes with two USB ports with each having DC 5V/2A output. The Syska 10000 mAh Power Bank has been equipped with a Lithium-Ion (BIS Certified) battery, which allows for the device to have a sleek and trendy design, while at the same time reducing the weight of the device which is 285 gms. The Syska 10000 mAh Power Bank has a dimension of 141 mm x Width 62.1 mm x Depth 22 mm and has been provided with a chassis made out of ABS housing and comes with a warranty of 6 months from the manufacturer. incorrect insertion of USB plugs, over-voltage protection and protective circuits for the cell. The power bank has been provided with a classy design, lively colour combination, elegant looks and an LED Indicator. The device which measures 16.0 x 7.5 x 2.2 cm in dimension, weighs 355 gms and is only available in white colour. On purchase of the device, you will receive within the box a Power Bank, a micro-USB Cable and a User Manual. The Intex 10000 mAh Power Bank is also available for under 1000 Rs. 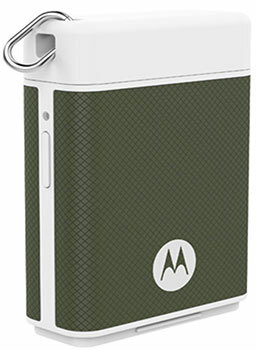 This particular power bank by Motorola is one very unique device which that offers its consumers some unique options. The small device packs within itself a small battery of 1500 mAh capacity and is fairly usable in case of emergency situations. The device also extends as a smart keychain, which means you can attach your keys to the power bank and carry it along with you, in your pocket. The best feature of this device is that it comes with Motorola Key Link feature which allows the user to find their keys and phones if they are not seen around. Philips (DLP6006N)11000 mAh Power Bank, Ambrane (P-1122)10000 mAh Power Bank, Ambrane (P-1133)12500 mAh Power Bank, Ambrane (P-1310) 13000 mAh Power Bank, Honor Powerbank 13000 mAh, Billion (PB130) 10000 mAh Power Bank, Flipkart SmartBuy 10000 mAh Power Bank, Micromax MXAPB_10400 10400mAH Power Bank and Portronics POR-010 “Powerslice 10” 10,000 mAh Slim Powerbank are some other power banks under 1500 Rs. which you can also consider, but it will be always better to go with our top recommendations. 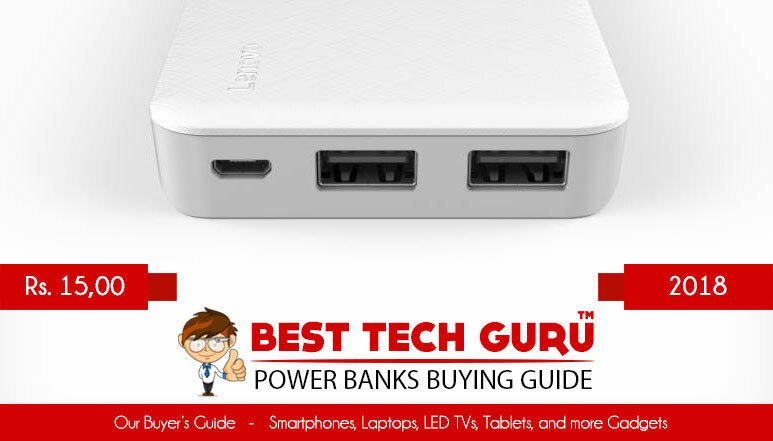 So, here is the quick summary of the 5 best Power Banks under 1500 Rs. Best Power Banks Under 1500 Rs. Please like and share this list of 5 Best Power Bank under 1500 Rs. with your friends and family and help them in choosing a new power bank.